The Weimaraner was bred in Germany in the late 18th and early 19th century from the same stock as other German Pointer breeds. They are said to have been bred from the old Bloodhound breed and were used as all purpose hunting and family dogs. They were commonly used by royalty as large game hunters and hunted animals such as deer, bear, and wolves. As the breed modernized and large game became less popular, they began to be bred for smaller game hunting. Today, the breed is a popular family pet in America and Britian but still serves as a good hunting dog. 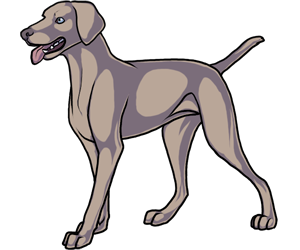 Because of its ghostly grey color, the Weimaraner was given the nickname "the Grey Ghost." Weimaraner puppies are bron with blue eyes and stripes which disappear as they mature. Initially, Germany was very protective of the breed and sterilized many dogs that were exported to America.